After launching its flagship Alturas G4 SUV, Mahindra is all set to attack the compact SUV segment with the XUV300; to be launched in the first half of February 2019. After shaking up the MPV and premium SUV space with the Marazzo and its flagship SUV, the Alturas G4, Mahindra's focus has now shifted to its compact SUV offering which has been christened XUV300. Prior to the name reveal, the model in question had been codenamed 'S201'. By combining India's love for SUVs and the major space constraint in most of our metropolitan cities, the compact SUV segment is the one which gives us the best of both worlds, making it ever so popular among Indian car buyers. This fact can be backed up by numbers as well. In October 2018, the Ford EcoSport, Mahindra TUV300, Maruti Suzuki Vitara Brezza and the Tata Nexon together sold 26,510 units. This amounts to a 9.43 per cent share of the total cars sold in the month. Coming back to the car, the Mahindra XUV300 is based on the SsangYong Tivoli (sold in the international markets), much like the Alturas G4 is based on the SsangYong Rexton. The Tivoli measures around 4.2 metres in length (4,202mm). So, it will be interesting to see how Mahindra will reduce the XUV300's dimensions without compromising much on the interior space as here, it will qualify for the sub-four-metre compact SUV segment. Mahindra is no stranger to the segment as the TUV300 was the brand's previous compact SUV offering. However, while the TUV300 was made on a ladder-frame chassis, the XUV300 feature a monocoque chassis, making it similar to its elder sibling, the XUV500. As far as the powertrain of this five-seater is concerned, expect the XUV300 to feature Mahindra's 1.5-litre diesel motor mated to a six-speed manual transmission, which is already seen on the Marazzo. In the Marazzo, the diesel motor develops 121bhp and 300Nm of torque. The XUV300 will also be launched with a petrol derivative. However, customers will have to wait longer for an automatic version as there won't be one at the time of its launch. Now, Mahindra claims that this compact SUV will be loaded with premium, first-in-class features and safety tech, so much so that they are even calling it their most advanced vehicle, till date. This declaration by the home-grown car maker seems plausible if one glances over the offerings of the Tivoli SUV. In the international markets, the Tivoli comes with a host of premium features like a heated steering wheel, mood lighting, LED DRLs with projector headlamps, soft-touch leather interiors, ventilated driver's seat, heated front seats, cruise control and a configurable supervision cluster. On the safety front too, the Tivoli packs in a lot of tech as it gets seven airbags, ESP (Electronic Stability Program), TPMS (Tyre Pressure Monitoring System) and Advanced Driver Assistance Systems (ADAS) like Forward Collision Warning (FCW), Lane-Keep Assist (LKA), Lane Departure Warning (LDW), Autonomous Emergency Braking (AEB) and Traffic Sign Recognition (TSR). While we do not have all the details and specifications of the XUV300 with us yet, we can do a quick analysis of its competitors in terms of what premium features they offer. Its archrivals, the Ford EcoSport and Maruti Suzuki Vitara Brezza, offer projector headlamps, touchscreen-based infotainment systems with Android Auto and Apple CarPlay connectivity, rear parking sensors, reversing camera, inbuilt navigation and push-button stop-start. While the Brezza comes only with two front airbags and no sunroof, the EcoSport offers six airbags and an electric sunroof option. Further, the EcoSport goes an extra mile to offer paddle shifters as well for its automatic transmission. The good news here is that the XUV300, like its international sibling, will also feature seven airbags. When launched in February 2019, it will become the first car in its segment to do so, beating the Ford EcoSport. To put things into perspective, even the Creta (which, in our opinion, belongs to a different segment), also offers six airbags. Thus, the XUV300 will prove to be quite a competitor across the board. 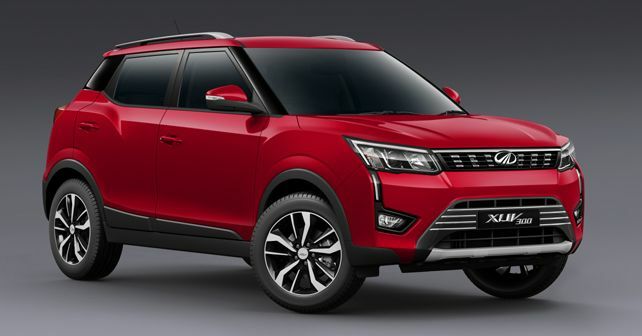 While Mahindra has not revealed the entire list of features and specifications yet, what has been confirmed is that the XUV300 will also get 17-inch alloy wheels, all four disc brakes and dual-zone climate control. It will be sold through the mainstream section of Mahindra dealerships across the country. Meanwhile, Mahindra has also confirmed that it is working on an electric version of the XUV300, which has been codenamed 'S210'. It is expected to make its debut sometime in 2020.